The sun erupted with a powerful solar flare Monday (July 2) in an early solar fireworks display just in time for the Fourth of July. A wave of plasma from the flare could reach Earth by the U.S. Independence Day holiday on Wednesday, July 4. The sun storm came from a large sunspot called AR1515 that is now rotating across the Earth-facing side of the sun. It unleashed an intense solar flare at 6:43 a.m. EDT (1043 GMT) today in what is expected to be one of several strong solar storms in the days ahead, space weather officials said. Several space telescopes are monitoring the sun around the clock, with NASA's Solar Dynamics Observatory spacecraft capturing video of today's solar flare. The flare registered as a class M5.6 solar storm on the scale used by astronomers to measure the sun's weather. The sun's strongest storms come in three primary classes. The weakest storms are C-class flares, which have little effects that can be felt on Earth. M-class flares are moderate solar storms that can supercharge the Earth's northern lights displays. The strongest solar storms are X-class events. When aimed at Earth, the most powerful X-class solar flares can endanger spacecraft and astronauts in orbit, interfere with satellite signals, as well as damage power lines and other infrastructure on the ground. 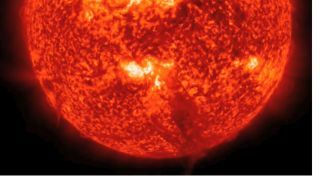 According to Spaceweather.com, a night sky observing and space weather tracking website run by astronomer Tony Phillips, the solar flare unleashed a wave of charged plasma called a coronal mass ejection (CME), but the particles were not aimed squarely at Earth. "The eruption also hurled a CME into space, but not directly toward Earth. The south-traveling cloud could deliver a glancing blow to our planet's magnetosphere on July 4th or 5th," Spaceweather.com wrote.